BABYMETAL — the heavy metal offshoot of the Japanese pop idol group SAKURA GAKUIN that performs a distinctly Japanese mix of schoolgirl J-pop and metal — was interviewed at the U.K. edition of the Sonisphere festival, which is being held July 4-6 at Knebworth Park in Hertfordshire. You can now watch the footage below. 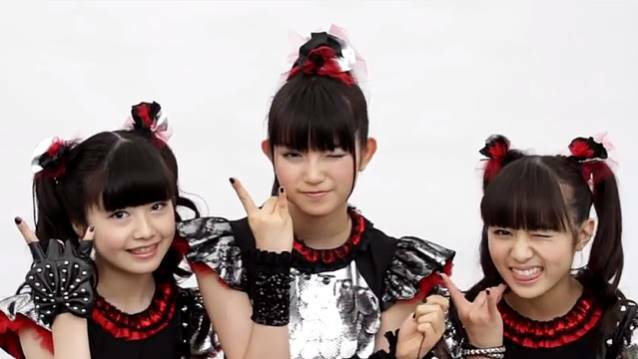 "Our goal is to start a new genre of metal called Kawaii Metal [Cute Metal]," BABYMETAL said. "We are the only band making music in this genre right now and we want this genre to be accepted." BABYMETAL kicked off its world tour with a headlining show on July 1 at La Cigale in Paris, France. BABYMETAL will also play a headlining show at the Fonda Theater in Los Angeles on July 27. BABYMETAL became the youngest artists to ever appear at Tokyo Nippon Budokan when they took the stage at the famed venue on March 1 and March 2. Sayuri Iwai, previous holder of the title, made her Budokan debut at 15 years old and one month. She was usurped by Suzuka Nakamoto (16), Moa Kikuchi (14) and Yui Mizono (14), who hold a mean age of 14.6 years. BABYMETAL released its debut album on February 26 via Toy's Factory. The effort was made available in regular and limited editions. The CD includes five of BABYMETAL's singles that were released in 2011 - 2013, from "Doki Doki Morning" (digital single) to "Megitsune", their B-sides and three new songs. "Babymetal" made it to No 3 on iTunes' U.S. rock chart and was in the Top 10 in six other countries, including the U.K. The band's video for the song "Gimme Chocolate" has received nearly 10 million views on YouTube, and BABYMETAL was featured on the cover of the U.K. weekly rock magazine Kerrang! The band's first major single, "Ijime, Dame, Zettai", sold 19,000 copies in its first week and debuted at No. 6 in the Japanese Orion weekly singles chart.